V Magazine is our bi-annual magazine celebrating our volunteers hard work and achievements. We love celebrating our volunteers and, to show them how much their hard work means to us, we’ll be creating a special thank you edition of our volunteer magazine. We’re looking for budding artists, creative minds and hidden Picassos to design the front cover of our next magazine! The theme for this edition is ‘saying thank you’. The front cover will need to reflect our thank you theme. Our magazine layout is square, measuring 21cm x 21cm. The competition is open to everyone and you can choose any medium whether that is drawing, collaging, embroidery, photography, sculpture – we encourage you to be as creative as possible. Deadline for entries is Monday 3 June 2019. The front cover will be selected by our retail Volunteer of the Year winners and senior members of our Volunteering staff in mid-June. The chosen designer will also feature in our magazine and we will organise an interview between 17–21 June. Please email high quality photographs or scans of your designs to the Internal Communications Team by Monday 3 June 2019. If you have any queries please contact the Internal Communications Team, [email protected]. The magazine’s aim is to recognise and thank our volunteers across the organisation, whether they volunteer in retail, community fundraising, at our fundraising events or in our offices. 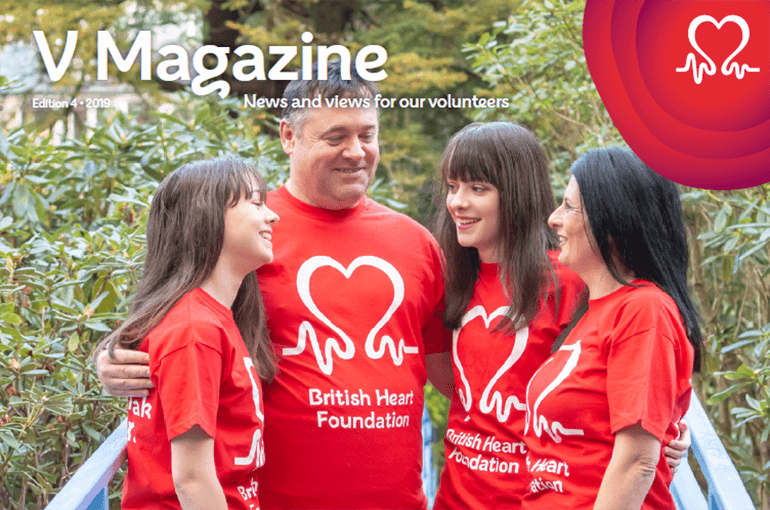 The magazine also includes volunteering opportunities, research updates and information about what’s been happening in the world of BHF volunteering over the past six months. In this edition we meet the McWilliam family who set up and run the Kintore, Kemnay and District fundraising group in Scotland. The BHF is a charity close to their heart as oldest daughter Jade was born with four heart defects. Download your copy to read their incredible story of dedication and support. If you would like the chance to feature in the next edition of V Magazine, or have suggestions of how we can enhance the magazine, please give us your feedback.